Doucet offers a fully automated solution to grade and nest your flooring, a system with reliability at its core design. Doucet offers a fully automated solution to grade and nest your flooring, a system with reliability at its core design. This is the ultimate nesting and packaging solution for flooring manufacturers searching for quick return on investment. The low level of required labor to operate the equipment combined with the efficiency of packaging accurate quantities insures the success of the project. The grade and length are the two main characteristics used by the nesting system. This information is obtained after end-matching. Boards with untreatable characteristics or to be repaired are returned to manual processing stations. The boards leave the out feed of the end-matcher and are released onto belt conveyors, towards guillotine traps which control the movement of the boards by closing or opening if necessary. Once the boards arrive at the end of the conveyor, a pneumatic arm stands them up, ready for pick-up by the grippers. 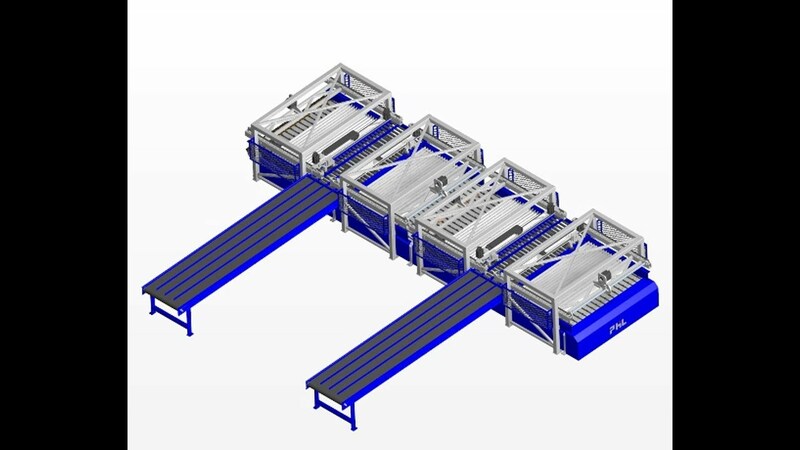 The EZYPAC 300 Automated Nesting System has multiple modules with 15 sorting bins which are designed around the customer's volume, grade and length configuration. Each module has two sets of grippers, mounted on a multiple axis manipulator system, and takes two boards at once to place them in the proper row forming bin, based on length and grade of each board. When the row is completed, a bottom trapdoor opens and the row of boards slides down onto a chain transfer in a synchronized sequence. The individual sorting bins can be reassigned to any grade "as needed" by the EZYPAC 300 Automated Nesting System as soon as they are emptied. Based on their grade, each row of boards is proceeding onto the appropriate grade accumulating bundle conveyor. Rows of boards are staged side by side to build a bundle layer approximate 10" wide before being pressed to interlock the tongue & groove of the boards. Once the necessary numbers of layers are ready for a specific grade, a vacuum stacker carries one layer at a time and stacks them on a table which also acts as an exit conveyor. When the bundle has reached the required number of layers, the bundle is then strapped, printed with production information and handed off to the MANYX palletizing system. Based on production volume and numbers of grades, the quantity of modules and conveyors are customized according to customer's applications and needs.